Aren't you suppose to say we're filming a documentary Tammy? I told them we were filming a commercial for Helman's mayonnaise. You were on the amazing race!?!? the reflecting pool was season 8 right? I think the second one sounds a lot more believable, but hopefully we can get this picture if the first one is indeed true? Michael D, I am with KingCrimson88. I think that Prague is long overdue as an Amazing Race city. However, I think it could be the long-rumored Central European Amazing Race rather than AR12 that was visiting there. On Burkina Faso I must say that it is not a country with anthing special to attract a stop by the Amazing Race. It has no remarkable geographic features, no unique major products, and nothing to distinguish itself from any other West African country. It is very poor but so are most of those countries. I see no compelling reason for AR12 to be stopping there but that does not mean that it did not happen. Look at her Name. baneredbeans. It should ring a bell. The only episode of this Amazing Race that actually made me cry. To think, in the first 5 minutes I of the first episode, I didn't think I would like this team. Boy was I ever the hell wrong. As much as I want some good ol spoilers for season 12. After AR Asia (and how surprised I was on how much I enjoyed it), I want a Europe version. I know they have talked about and even taken apps. I blame the US education system which focuses so heavily on "Western Civilization, ie a ton of things in Europe) that I have always been facinated by it and would love to see a full regional show in that area. omg your the gaghan family i loveddd you guys!! i cant believe the name didnt click. I was thinking this time out they might actually want more publicity so people would "talk up" the show. According to my coworker, the contestants and camera crews were initially coy about what program they were working on, but eventually some of the contestants said it was TAR. This is the same user who was posting the Burkina Faso spoiler. Perhaps the first destination of AR12 is Burkina Faso. There are 24 airports in the country, but I am going to speculate that an Amazing Race would take the quickest and simplest into the country and that is arriving in the capital city of Ougadougou. There are nonstop flights to OUA from Paris - Charles de Gaulle (CDG). The question of which U.S. city was the start point is important but I am not going to get hung up on it since almost every major U.S. city in the eastern half of the country has non-stop flights to Paris. Just for the purpose of example, I am choosing Washington - Dulles(IAD) as the starting airport. The flights from CDG to OUA are only on Saturdays and Wednesdays and the sighting was apparently quite recent, so I am going to pinpoint the departure date from the U.S. as the afternoon/evening of Friday July 13. From IAD that means AF27 departing 2020 arriving CDG 1150. There is an earlier flight, but why bother? The connecting flight on Saturday July 14 (Bastille Day in France) was AF730 leaving at 1610 and arriving OAU 1940. That's all I can say right now. I am going to think about where the Race could logically go next. I see probably a minimum of 2 more legs in Africa and none in South America, then a route up to Europe and across Asia. So, now you can make your own guesses on where the Amazing Race is headed. From Ougadougou there is no water transportation and going by land to the next place is not very likely. Teams will almost ceratinly have to fly somewhere. Where will it be? I took a look at going to Timbucktu or to Kinsangani, Zaire, but both of them involved long, difficult trips with many connections. I like the first 5 places as countries where the Amazing Race has never been or has only been tangentially (Zambia in AR1). I like Arusha to utilize all the planning from the lost AR11 pitstop. I like Nairobi for its access to white water rafting and several gorgeous national parks. 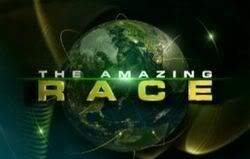 Please nominate where in Africa you think the Amazing Race will go and why. Seriously it was hate at first sight (kidding) but I didn't like the opening. But by the time you guys had made it to the sporting goods store, I was loving your team. I don't know why they wanted us to come off all know it all snotty like. Maybe this way it showed how the race changed us and made us better people - who knows??? I think that they may do a hop around West Africa initially - which would be cool. My brother has worked in both Nigeria and Ghana for extended periods of time and from what he told me that would defnitely be placing someone out of their western world comfort zone. The Gambia is also quite tourist friendly. I would like to see them go to Kenya - Mombassa - beautiful scenery. as to the lost pit stop in Arusha would someone mind explaining what happened? I'm game. The finish of the pitstop after Mozambique was supposed to be in Arusha, Tanzania after teams flew there from Zanzibar. However, the massive delays in flights from Johannesburg to Dar es Salaam threw the schedule off for all teams, some arriving in DAR more than one day behind others. Decisions were made to pull the pitstop back from Arusha to the fort in StoneTown, Zanzibar. This eliminated Arusha as a pitstop. However, its international airport was still a connecting point for several teams to get to Europe on the way to Warsaw. More detail is available on this in the AR11 threads. Cheers apskip!!! I'll have a dig around over there. And that would make it an easy addition to this race. Hi Tammy! It's KenF from TarFlies. Nice to see you here. I'm not sure if this is helpful but I just got word from one of the musical composers of the show and he's already in the process of mixing cues for the show. Maybe this means that we'll get a TAR season before December maybe? Well I guess the good news about all this is that the rumor about TAR being cancelled seems to be false now. Hi banredbeans aka Tammy =) I thought you guys were great on the show. I have to agree with many other people when I say that it was really sad to see you get eliminated all because of a red bean! Gosh I hate those type of challenges, they always eliminate the best teams on the show! Hey guys, I might have some news that could confirm the next amazing race is a family thing with teams of two. Well, like a year ago I sent a letter to Phil saying they should have a family edition but with teams of two and actually have a world-wide race and stuff. because at my front door came a package with a SIGNED photo of Phil came! and then he wrote a smiley face. And I couldn't understand what think now meant until i came on here and saw that it was a rumor that it would be a family edition with two people on a team! OMG! Maybe I gave them the idea! cool! Well, "NOW" is the name of his new show so who knows? I'm not sure. Where is any info on that? and i thought his show was no oppurtunity wasted?